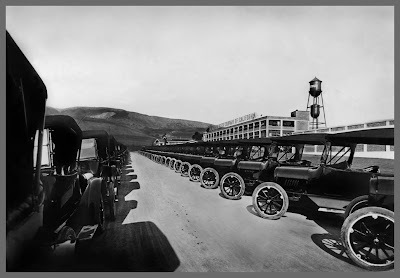 With today's closing of the last auto manufacturing plant in the Bay Area, I felt compelled to share this view of the Chevrolet plant located near what is now Eastmont Town center in Oakland. NUMMI is now in the rear view, the shift locally from an area once made more ships than anywhere else on the planet during World War Two (Kaiser / Liberty Ship operations), is remarkable. In 1916, General Motors opened a major Chevrolet automobile factory in Oakland at 73rd Avenue and Foothill, which is the current location of Eastmont Town Center, making cars and then trucks there until its closure in 1963. The 1920s were economic boom years in the United States as a whole, and in California especially. Economic growth was fueled by the general post-war recovery, as well as oil discoveries in Los Angeles and most notably the widespread introduction of the automobile. The 1920s were economic boom years in the United States as a whole, and in California especially. Economic growth was fueled by the general post-war recovery, as well as oil discoveries in Los Angeles and most notably the widespread introduction of the automobile. In 1916, General Motors opened a major Chevrolet automobile factory in Oakland at 73rd Avenue and Foothill, which is the current location of Eastmont Town Center, making cars and then trucks there until its closure in 1963. My dad, Alex J. McDonald, worked at GM for 36 years, 1936-1972, first at the 73rd and Foothill location, then after 1963 in Fremont.